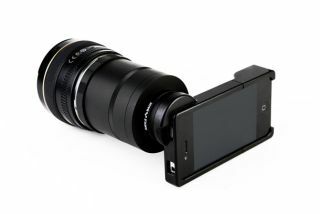 Photojojo has announced a lens mount for DSLR lenses that is compatible with the iPhone camera. The adaptor, which is part of an iPhone case, allows Canon EOS or Nikon SLR lenses to be mounted onto the iPhone. Several different types of lenses can be attached, including telephoto, wide-angle, macro and fixed length, which will only be able to be manually focused once fitted. Furthermore, only lenses with an aperture ring, such as old film camera lenses, will have the ability to adjust aperture when mounted to the iPhone. Photojojo also say that around 1 to 2 f-stops are expected to be lost when using the adaptor, so if you can't alter the aperture, expect to brighten up the images in post-production. Since the mount doesn't have a mirror inside as an SLR does, photos taken will be upside down and need to be rotated using an editing app. The Nikon SLR mount works with all Nikon lenses using an F-mount adaptor, while the Canon SLR mount works only with EOS lenses using an EF-mount adaptor, meaning Canon EF-S or FD lenses won't work. The case, which is made from aluminium, comes with a special UV filter along with 2 loopholes at both ends to allow for a camera strap to be attached and the iPhone and lens hung around the neck. Photojojo sells a range of camera accessories, and already stocks an iPhone telephoto lens and iPhone video rig. The adaptor can be bought for either iPhone 4 or iPhone 3, priced at $249.00 (c. £156) and $190 (c. £119) respectively. Find out more at the Photojojo website.